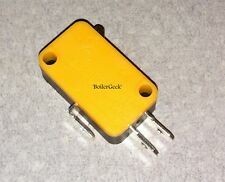 Miniature V4T6GP Microswitch. Burgess England. Changeover operation, on pushing button, 1 and 3 are closed. Push button action. 5 x Push Button Microswitch SPDT 5A Micro Switch. Miniature V4T7Y1GP Microswitch. Burgess England. Lever action to operate push button. in a Changeover operation. Roller Lever Actuator Microswitch SPDT 5A Micro Switch. Part Number is 2HBA1 also known as HBS2KHX3SA011C. In this “Buy it now” you will get 1pc of 2HBA1 Micro Switch 20 Amp C/O Precision Unimax. With this buy it NOW you get: Micro Switch 20 Amp Change Over Precision Microswitch Unimax x 1pc. This microswitch is found on many appliances. Why replace a zone valve when all you need is another microswitch?. HONEYWELL #272744B/U & Cherry D42 switch except that this one is rated at 10A and Cherry D42 and Honeywell #272744B/U is rated at about 1/3 of this! Button micro switch microswitch 3a 125v 250v 28mm x 16mm x 10mm body lever 29mm. Part# E23. SPDT, 5Amp, 125/250 VAC. Sold AS-IS in proper working order. Brand new, high quality medium lever action microswitch. Ideal for general purpose use. Quantity : 1 Switch Action : Medium Lever Microswitch Maximum Rating : 5A at 250VAC Operating Force : 0.25N Release Force : 0.06N Pre-Travel : 5mm Over-Travel : 1.2mm Differential Movement : 0.8mm Operating Temperature Range : -10°C to 125°C Operating Life : 1000000 operations Size : 20mm (Body Length), 5.8mm (Body Width), 9.5mm (Body Height) Connector Height : 4mm Lever Length : 24mm . 5 x Medium Lever V3 Microswitch SPDT 16A 250VAC. It is ideal if you need to repair faulty switches on your remote key. Micro switches can be replaced by using solder iron. Short Lever Actuator Microswitch SPDT 5A Micro Switch. SPDT so 1 x N/O N/O (3 Fastons) Quick Connect. A High quality V3 standard size microswitch. Switch type Microswitch with a high Op Force of 225g. This buy it now you will get 10pcs of a Microswitch as above;. HONEYWELL V399894M MICRO SWITCH. 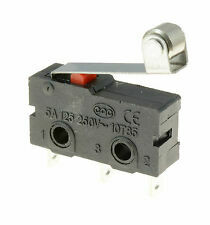 Manufactured by Honeywell as their type V399894M, these are a quality industry standard pattern Microswitch. Connection: 2 x Male Push Fit. Width: 16mm. 5 x Short Lever Actuator Microswitch SPDT 5A Micro Switch. 5 x Long Lever V3 Microswitch SPDT 16A 250VAC. A High quality V3 standard size microswitch. Switch type Microswitch with a High Op Force of 150g. This buy it now you will get 10pcs of a Microswitch as above;. Switching capacity of 15A at 250V AC. SWITCH, Micro with plunger. Lever Operation Miniature Microswitch. 0.1A 30VDC. two highly precise split springs that ensures a. bottom with different levels prevent flux penetration. long durability. Manufactured by Panasonic - Part # ABV163461. Conforming to IP67 of IEC protective construction classiﬁcation. Our REF#1567. Agricultural devices. High current microswitch with hinge lever actuator. Manufactured by Panasonic - Part # AM1501KF. 10 A High current switching capacity and high precision. Our Ref: #1407. During that process you will be issued with an RMA number. Images shown are for demonstration purposes. HONEYWELL 16 Amp Micro Switch LOT of 2 SPDT (Single Pole Double Throw) V5P110PB3C MICRO SWITCHES. Release Force 20 g Min. Original unused Honeywell Micro Switch, item is OEM not a cheap knock off. We stand behind all our products. We believe these are custom made. Dropsa Lubrication Control System Limit Switch 3164126 New & Unused PAYPAL ONLY FOR OVERSEAS BUYERS. These sealed snap action Cherry switches are manufactured to the highest standards for quality, reliability and durability. These are enclosed switches with protection IP67 and large switching loads. 1 NC, 1NO & 1 C CONNECTION. PAIR OF PUSH MICROSWITCHES. Brand new, high quality short lever action microswitch. Ideal for general purpose use. Quantity : 1 Switch Action : Short Lever Microswitch Maximum Rating : 5A at 250VAC Operating Force : 0.25N Release Force : 0.04N Pre-Travel : 4.6mm Over-Travel : 0.8mm Differential Movement : 0.8mm Operating Temperature Range : -10°C to 125°C Operating Life : 1000000 operations Size : 20mm (Body Length), 5.8mm (Body Width), 9.5mm (Body Height) Connector Height : 4mm Lever Length : 17mm . 3 terminals, long roller hingle lever, applicable to AC DC control circuits. Designed to control the movement of a mechanical part. Typically utilized in industrial control applications to automatically monitor and indicate whether the travel limits of a particular device have been exceeded. High precision mechanism design offering acute operation and long life. Brand Unbranded MPN Does not apply UPC 4894462073421 EAN 4894462073421 ISBN 4894462073421 Designer/Brand Unbranded UPC 4894462073421 EAN 4894462073421 ISBN 4894462073421. Miniature V3R Changeover microswitch with roller. NTE Microswitch. Changeover operation –. 6A 250V 10A 125V. Black push button pressed by lever when roller is actuated. This set of 10 4-pin push-to-make tactile switches allowing for switch interaction in your circuit within a close proximity of the soldered surface. They are solidly constructed to allow repeated use. 5 x Short Lever V3 Microswitch SPDT 16A 250VAC. Cherry KWHC0001 5 Amp 125/250 Vac SPDT Lever Switch Quantity 1 Fast Shipping! Cherry KWHC0001 SPDT 125 / 250 VAC 5 AMP 1/4 HP. Manufacturer: Cherry Manufacturers Part #s: KWHC0001. Quantity of 1 Switch. 12.7mm long, 5.8mm wide, 6.5mm high. 1.3mm pre-travel. 0.2mm over travel. 20gf release force. Button actuator. Images shown are for demonstration purposes. Cherry D42 switch except that this one is rated at 10A and Cherry D42 is rated at about 1/3 of this! This microswitch is found on many appliances. Why replace a zone valve when all you need is another microswitch?. Plungers Type. V4 Microswitch Miniature Button Pin. All types are free form OT restriction and permit easy setting. Type SP in size (110.2H X 19.8W X 6.4D mm) and weight (approx.2.2g). Approved By Standards. 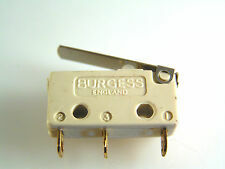 BURGESS VCSPY SHORT LEVER MICROSWITCH. Manufactured by Burgess as their part number VCSPY, these are a good quality industry standard V3 style microswitch, with short lever / actuator. 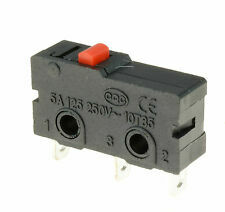 Button micro switch 3A, 125V, 250V. Unimax part 2LMC or LMGGE2P0. This buy it now you will get 1 pc of a Microswitch as above;. SWITCH, Micro with plunger. Function Change over with 1 N/C & 1 N/O (3 turrets). 250V AC, 6A. A high quality precision Cherry micro switch that satisfies industries, including automotive, white goods, security, vending and office automation. The switches have been manufactured to give rugged performance. (V7L (BJ code). OMRON Ultra Miniature Microswitch D2MQ-1L. 0.5A 24VDC. Leaf lever Operation Single Pole Double Throw. Ultra Subminiature Basic Switch D2MQ-1L. Snap-action Switch with Ultra Subminiature Size 6.5×8.2×2.7 mm (H×W×D)) and Light Weight (0.3 g).